The dental examination shows how healthy your mouth is. After the examination, you and your dentist can discuss the results and plan the best way to deal with any problems. Why you've come for an examination. Any problems you've noticed (such as pain or sensitivity). Your general health and any medicines you might be taking (because these can affect your dental care). Your diet (because sugary snacks and drinks can cause tooth decay). How you clean you teeth (because correct cleaning helps prevent tooth decay and gum disease). tell you about any treatment you need, explaining the choices and whether there will be any cost. Your dentist will give you an Oral Health Score© (OHS). This is a score, out of 100, which tells you how healthy your mouth and teeth are. Your OHS is made up of separate scores for the health of your teeth and gums, the condition of any fillings, crowns or other treatments you have done in the past, and your own views about how your teeth and gums look, how they feel and how efficient they are. This is a totally new approach to keeping you in the picture about your own dental health. It shows you how your mouth, teeth and gums are benefiting from the care you and your dentist give them. The score is made up of the following (not all of them may apply to you). How many teeth you have and how well they bite together. How well any fillings, crowns and other dental work are wearing. Whether you have any cavities (tooth decay). How healthy your gums and the inside of your mouth are. Your own opinion on how your teeth look, whether they are comfortable and whether you can eat without any problems. The condition of any dentures or dental implants. Your dentist will check your Oral Health Score© regularly. It will show any problems and help your dentist to work with you to correct them. If you have any questions, please ask your dentist or a member of the practice staff, who will be pleased to help. X-rays show what is happening inside and around the tooth and its roots. They will show any decay or gum disease, bone loss and, in children, how the jaw is growing too. Dentists use two types of x-ray. You grip a 'bitewing' x-ray between your teeth and it shows the areas in between the teeth but not the roots. 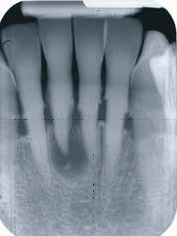 A 'periapical' x-ray is placed next to the tooth and shows the whole of the tooth and its root. There are also large x-rays which show all of the jaw and teeth. These are called panoramic x-rays and the x-ray machines moves around your head while you stand still. 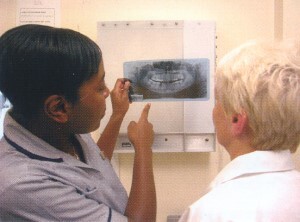 Trained members of the dentist's staff can take x-rays, as well as the dentist. Training makes sure the x-rays are taken safely, as well as being clear to read. There is a small risk of radiation in x-rays that are taken for health reasons but dental x-ray radiation is very low. All forms of dental treatment rely on dental x-rays. Simply looking in your mouth cannot give the dentist as much information. X-rays allow your dentist to review old treatment as well as identify new problems.